This is just too cool! Thank you for sharing your plan in its entirety. I think read-alouds in later grades are great, and not done enough. Can't wait to read this when it comes into my collection! I'm glad you like the information. You won't be disappointed with the book. Bookmarked your post! I definitely will use your visual guide next year when I read WONDER to my class. Amy, you could always start your read aloud now. Just sayin'. It's a great time and a great experience reading it aloud to students. Enjoy! About how long did it take for the read aloud--how many minutes a day for how many days? The read aloud took all of March, right up until spring break. Between reading, discussing, watching videos, viewing the website, and a few short activities, we spent about 45-60 minutes a day. It turned into a full-blown unit, more than just a read aloud. Thank you so much, our summer school group is going to use your site. Thanks! Great to hear. Hope summer school goes great for you and the students. Thanks for sharing your read aloud presentation! I linked it to my blog (teacherwillrunforbooks.blogspot.com) it's just too awesome to not share :) Happy Teaching & Reading! Thanks for sharing the resource. Glad you found it helpful. Thank you so much for sharing. Wonderful ideas and resources. Brian, this is a great unit. I'm in the middle of reading this and cannot put it down. Thank you so much for sharing your hard work with the rest of us teachers. Barbara and Karen, thanks for taking the time to share your thoughts, but thanks especially for using such an incredible book with young readers. Wow! This is amazing!! I loved Wonder and received a grant this year to order copies for my students. I am so excited and when I cam across your site I was ecstatic. You have done a fantastic job putting this together. Thank you so much for sharing!! Wow. This is tremendous. I can't wait to utilize this tomorrow for our first day of school. I am certain this will be an invaluable resource. Thank you! I wasn't planning to read Wonder until November, but I was showing my kids the book trailer and they were so excited that I started it today. These resources are great! Thank you so much! 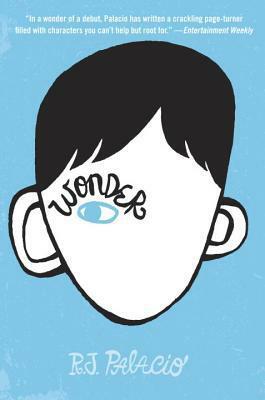 I read Wonder over the summer, and am anxious to start the read aloud with my fifth grade class later this week. Your site is extremely helpful! You have done such a wonderful job with this site. I am an elementary counselor and will be doing a book study with Wonder in my 5th grade classes as part of my guidance lessons. I am so happy to have found your site. Thank you! Thank you so much for this fantastic resource. My fifth grade class just finished reading the book together. Prior to sending them off to read independently, we would preview each chapter on our promethean board. You made the book exponentially more interesting than anything I would have come up with. Now they are asking for the next book but, honestly, I don't know if I'm going to be able to find something to top Wonder. Any ideas are greatly appreciated. Thanks again. King, glad you enjoyed using the resources. For your next book, maybe give your class something completely different. Something like H.I.V.E. or The Hero's Guide to Saving your Kingdom or short stories from Guys Read or silly nonfiction like Uncle John's Bathroom Readers for Kids or ... well, you get the picture. Something were kids won't really be able to compare to Wonder. This is fantastic. It really brings the book to life, which many kids need to make connections. I can't imagine the investment of time you made to gather the resources for your students, and thankfully ours, too. Thank you so much for this. Wonder is one of the best books I've ever read, especially with the 6th graders...they love it! This really was a great opener everyday. To give them some more understanding and some visuals. THANK YOU! I used all your Wonder resources with my fifth graders as we read the book. And while your resources greatly improved the comprehension of my kids with Asperger's syndrome or language processing disorders, they also enhanced the comprehension of all my kids. So many light-bulb moments, thanks to you, Brian. I just really appreciate all your time, effort, and resourcefulness to create this reference tool. Finally, Wonder itself is a call to all of us to be better human beings, and as such, I wanted my kids to deeply reflect on its messages, so they are currently writing five-paragraph essays about it. So, in your spirit of sharing, here are my prompts (which can likely be improved on), incase you’re interested. Thanks again! A precept is a general rule intended to regulate behavior or thought. An inscription on an Egyptian tomb, “Your deeds are your monuments,” is an excellent example of a precept. Choose three characters from the book who show just how true this precept is. I can't thank you enough for this wonderful resource. My class gets so excited when they see my turning on the computer and picking up Wonder to read. The links to the songs are so great too. What a big hit and great way to share a novel with kids. Love it! Sorry if this already posted. Is this okay to read to fourth graders? THanks and thnaks for your resources. Yes, I'd say it's appropriate for fourth grade. The main characters in the book are in fifth grade. I am an ESL teacher in high school. I teach in a middle/high school combine of 600 ESL students ONLY. We are reading WONDER as a school wide read aloud over the PA every morning. I will definitely be using your plan with the rest of the book as well as using it as a review with my high school ESL English students. Thank-you. I'm using this book in a class with several ESL students, also. Your Web site is AMAZING. Thank you so much. This really helps build schema. Reading to my students, using your page....they are in love and ask why I haven't done this for ALL the books I have read to them. ha! I usually look up pictures for things to show them, but this is perfect. I plan on doing this for a couple other books this summer. Thank you!! This is SO helpful! Thank you for all the time and effort you put into this! This is brilliant! I'm going to be making use of some of these for a year seven (ages 11-12) scheme of work that I'm writing for September. I read this last year to my fifth graders and most of them told me it changed them in a good way. Your website is great! I'm so excited to use it next year when I read it again. Thank you! Thank you so much for this great resource! I teach 5th grade (for the first time) this year and I plan on using this book as our read aloud for the first unit which is Kindness. I love the principal's message to the kids at the end of the book. I will be using this website a lot for it. Thanks, again! Teaching reading for the first time in a while to 5th graders. I read this over summer and knew that this was the book I must start with. Thanks for putting these resources together, it will be wonderful to use with my students. Consider this a standing ovation from me. Thank you for the wonderful resource. Our middle school is doing a read aloud for grades 5-8 with Wonderand the kids are loving it. We are stopping to explain these things, but having them ready to go with pics and descriptions is incredible! I can't thank you enough! I've been searching for a book with many examples of allusions. After reading your lesson, I think I've found it. This is the first I've heard about the book, so I haven't read it yet. Would you say this is a good resource? I'm guessing you are referring to the Star Wars references. Yes, there are some allusions - like having a private guard - but most are pretty direct references, most with explanations. I can only say that I am so thankful to have found this amazing resource that you have created. I was reading the book on my own (I'm a sucker for good young adult literature) and was so moved by it that I have immediate plans to work this into my 7th grade ELA curriculum. Thank you for your work! This will truly supplement my lessons and will allow my students to visualize more aspects of the text. Kudos to all of your time and effort! Thanks from 6W in Sydney, Australia. Thank you, thank you, thank you! I am doing a book club with a 5th grade class (I'm a gifted resource teacher). We offered it as an optional activity- no extra credit, no grades, just reading. We though we might have a handful of kids interested. My principal purchased 10 copies. I never told them what it was about- just that is was AWESOME! Well, I must be quite the salesman, because 19 of her 21 kids wanted to read it. My principal purchased 10 more. Some kids got it on their eReader. All of them are now reading it. They voted to read rather than play a math game when I passed out the books! Thanks for this awesome resource. I will be linking it to our Edmodo discussions. "They voted to read rather than play a math game." This might be the highlight of my day so far. Thanks for sharing. wow!! Thanks a lot for sharing all this!!! I´ve been reading this book to my 5th graders and they really enjoy it, it´s hard to stop reading it and they love the group discussion!!! I found a link to this on Pinterest and am so glad I clicked on it! Do you think I could use Wonder with my 6th grade class this year? I'm a new teacher and am not yet sure what to expect. I don't want it to be too easy for the students to read, but the content is just outstanding and so meaningful. What do you think? Thanks! I don't think there will be any problem reading Wonder with sixth grade students. If you are planning to do any full class novel, remember it's going to be easy for some, difficult for some, and just right for the rest. And even if it ends up being easy text for the majority, students can then put more energy into digesting the content rather than decoding it. Thanks for sharing this book! I heard you read from it at the Lutheran Educators' Conference in Wisconsin, and so when I saw that book at Barnes and Noble, I decided to buy it. There was also a girl (3rd grade) that was looking at it with her mom. She was telling her mom about the book, so I asked her if she would recommend it to 6th graders, and she said "yes". I started reading it to my students in mid-December, and they are enjoying it. In discussing adages like "Don't judge a book by its cover", I pulled out the book and showed them the cover and asked how many of them would read it based on the cover, and none of them said that they would. Then I asked them, now that they heard part of it, and I decided to stop reading it, how many of them would want to finish reading it, and most of them said that they would. I'm starting this book with my kids on Tuesday, I love reading aloud. how long do you read aloud for? I'm also thinking of starting a partner read. To Anonymous, two comments above, I hope you chose to continue reading the book aloud even though most kids said they'd read it on their own. A shared book can be a powerful tool to use the rest of the year beyond just the lessons in the book itself. To Cristina, I like to read aloud for at least 15 minutes, but I also like to stop at natural breaks in the text, like chapters. Rarely will I cut short the 15 minutes, but it's not uncommon to extend it beyond the allotted time. Check out the wiki for Wonder at http://rj-palacios-wonder.wikia.com/wiki/Wonder_Wiki. Follow us on twitter at https://twitter.com/WonderWikia. Do you think this book would be appropriate to read aloud to 3rd and 4th graders? I teach a split class and most of them are pretty advanced readers. I was wondering if this is a good summer read for my daughter who will be in the 5th grade in the fall? Have you come across any discussion questions? Hi there, my daughter has just finished reading this with her school - she's in Year 4 and loved it. I have ordered a copy to read to my Year 3s. Is it going too be too old for them? Any thoughts on the appropriateness or lack of would be really appreciated. Thank you so much for these awesome resources. My principal purchased each homeroom teacher a copy of the book as a read aloud every morning. I can't wait to share this resource. Nery Cano, yes, Wonder would be a great summer read, and yes, I realize it is the end of summer. Wonder also would be a spectacular early fall read as well as an inspiring winter read and an engaging read in the spring. Nicole, I think it would be appropriate as a read aloud for year 3's. I am thinking about teaching this for my 6th graders this year. How long would you say it takes to get through the novel? Give yourself a good chunk of time each day - I'd say 20 minutes minimum for the read aloud - and plan on 4 weeks. It will take less than that if all you did was read the story aloud, but the discussion is well worth the time. This post actually made my day. You can not believe simply how so much time I had spent for this information! Thank you!